"American terrorists killed in bombing," read a headline in Iran's official Fars news agency, referring to an attack in Afghanistan that killed three U.S. servicemen. That came just a day afterthe Trump administration's announcement and represented a marked change in terminology by Tehran. 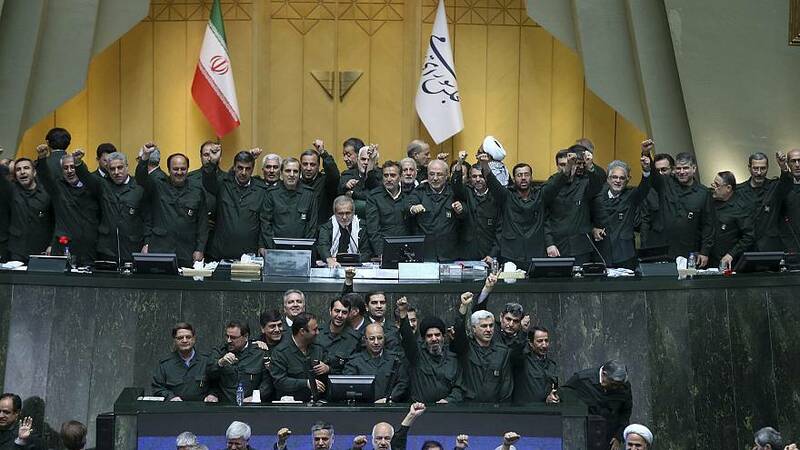 Iranian lawmakers dressed in military uniforms also chanted "Death to America" during an open session of Parliament on Tuesday. And according to the country's Mehr news agency, Parliament passed an emergency bill requesting that countries that arrest U.S troops should hand them over to Iran to face trial as terrorists. The White House's decision to put the powerful military unit with deep economic resources that answers only to the country's supreme leader in the same category as al Qaeda and the Islamic State group came a year after the Trump administration said it was withdrawing from the landmark Iran nuclear agreement. Richard Nephew, a former director for Iran at the National Security Council who served as a member of the team who negotiated the 2015 deal, said President Donald Trump's decision to designate the Guard as terrorists would most likely make American operations in the region "much more complicated." "If you have terrorists nearby ... what do you do with them?" he wrote in an email. "In the U.S. system, we have authorities that authorize military operations against them. The Iranians know that. Are they going to wait to be hit? Or will they hit first?" "What do we do if we capture IRGC officers somehow in Syria or Iraq? Do we turn them loose to the Iranians? They're terrorists!" he wrote. "And, what do the Iranians do if they capture U.S. 'terrorists' in the Persian Gulf as they did in January 2016?" Trump called the designation an "unprecedented step" that "recognizes the reality that Iran is not only a state sponsor of terrorism, but that the IRGC actively participates in, finances, and promotes terrorism as a tool of statecraft." Those who opposed the Obama-era nuclear pact — both in Washington and the capitals of U.S. allies in the Middle East — allege it gave Iran cover to pursue its ballistic weapons program and deepen its influence in the region. Both Israel and Saudi Arabia have warned for years of Iran's growing power, and were bitterly disappointed when Obama negotiated it. "The bottom line is the agreement was working, it was containing Iran's nuclear program and we had total international support and unity around this issue," he said. With the nuclear deal axed, that mechanism for the U.S. to address Iran's behavior is no longer available. "We've shattered all trust," Goldenberg said. "You could have had a negotiation on ballistic missiles. You could have had a negotiation on regional behavior. You could have had negotiations on future additional nuclear agreements." "This is part of a strategy by Iran hawks to layer on sanctions to make it more difficult for Democrats," a Republican congressional aide told NBC News when the designation was announced.